Located near to Coventry’s Ricoh Arena, which is shared by Coventry Football Club and the Wasps rugby team is The Hub, attracting home fans and welcoming away supporters. The Coventry Ricoh is also a concert venue, playing host to some big names in the past, such as Bruce Springsteen, Oasis, Take That, Coldplay and Rihanna is playing next month! The Hub has had a major facelift recently, including a new layout and new decor, attracting new customers to the venue. Hire Jukebox have installed a brand new VenueHub digital jukebox with over 7 million tracks available on demand including every UK top 40 chart release. We positioned the jukebox in a great spot, opposite the bar, near the pool table and fruit machines. It’s slimline and fits in perfectly with modern new look of the pub. Every week the jukebox is automatically updated with the latest chart releases via an Internet connection. The 32″ touchscreen is ideal for advertising allowing the venue to advertise sporting events and in-house promotions on the large digital display. As the landlord did not want any wiring showing, we hid it above the ceiling by gaining access into the loft area. Using high quality Wharfedale speakers, we divided the music zones into 4 different areas, allowing the venue to have more control over the sound. For example, they can now change the volume separately for the pool table area, when compared to the bar. Customers at The Hub want sport and music so the VenueHub jukebox was the perfect choice. We set-up to play SKY TV audio via the jukebox speakers when a game is on. Allowing customers to feel fully immersed in the atmosphere. The manager even has a menu key which is used to disable playing of the jukebox during a sporting event, ensuring no music is played during this period. Any songs that were selected previously, will be on pause until the manager uses the key to enable. 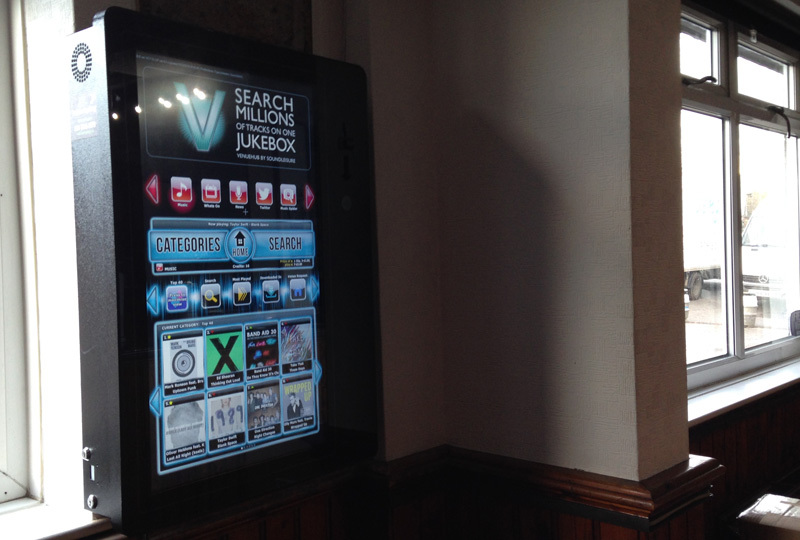 The Venuehub Jukebox helps the pub retain customers too. It keeps them there longer after the match, as once one person starts playing the jukebox, it tends to create a domino effect – other customers follow.